Though the atmosphere is the same as the TV series, K-On! The Movie’s coloring, photography, angels, and other various components were upgraded. What did director Naoko Yamada have in mind for the visuals? 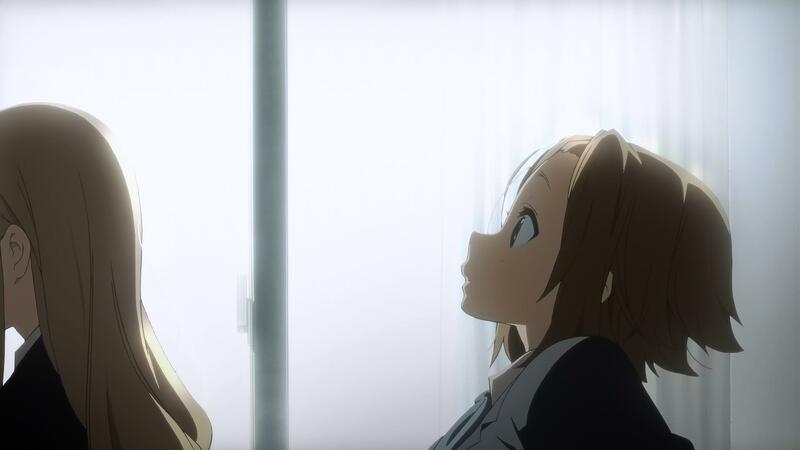 Here we talk with her regarding what she had in mind for K-On! – Were there any big differences in how you constructed the images for the movie compared to the TV series? The theatre screen appears much bigger, so my utmost attention went towards making images that would look like a movie. I thought about how each scene’s layout would look in live-action. There are a lot of fine calculations for the lens angle and the distance between the camera and subject that affect the atmosphere of a shot. The screen itself tends to have a bigger influence on the image for a movie than it does for a TV series. Thus I had to take into consideration things like where the characters would be placed, their size, and furthermore the amount of space above their heads. – What was your goal when constructing the images differently than in the TV series? I was quite particular in making it feel “real.” For that, I asked Yoshiji Kigami-san (A famous animator working since the 1980s who has become a staff member at Kyoto Animation) to supervise the layouts of the film. 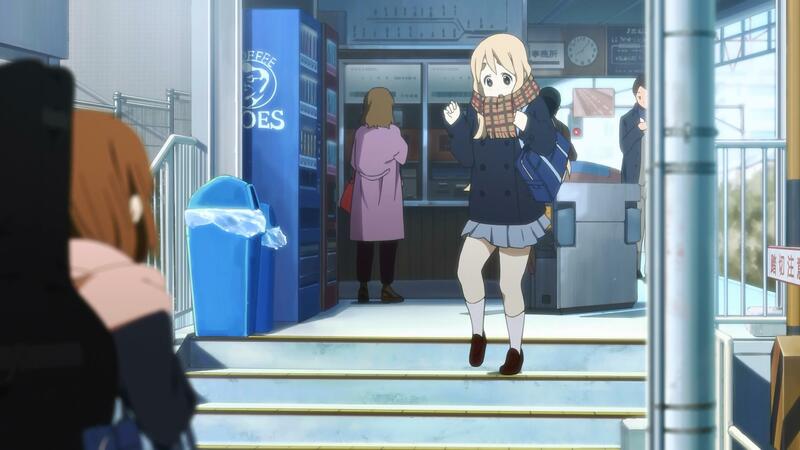 But I didn’t want it to be too different from the TV series; it was important to keep it feeling like K-On!. The balance between the two was something I obsessed over. – The movie felt more like the audience was a photographer than the TV series did. I wanted to continue pursuing the third years in a documentary-like setting throughout their third years, much like I had for K-On!!. As the TV series felt like the audience was a photographer getting closer to their subjects, the movie strengthened that feeling more. I thought about how a real camera would be placed in live action while making scenes. – That kind of direction was seen in scenes like the one at the end of the A-part where all the characters are on the phone at the same time. It really feels like a camera was just set up. There is a way I planned for the viewer to move their eyes, but with everything on the screen moving, it feels like the viewer is watching something realistic. I like that aspect of my direction there. – Could you please talk to us about some easier to understand portions of the film where you obsessed over that realistic feel? Well, the school scenes in the A and B parts were easier to understand like the hallway scene or the scene where Yui and Tsumugi meet Ritsu and Mio while walking to school. In order to bring out the atmosphere better, we altered the color of the sunlight and the lens through filters in order to give it a sensation that felt realer. We also did the same for the D-part when the girls come back to Japan from London in all the school scenes. I was extremely focused over the layouts and lens angles in order to best represent the girls’ growth and breathing. – What did you speak to the director of photography about regarding creating the visuals? We talked together about how to make the girls appear better to the audience and what steps the photographers would take in order to make that. During the TV series, we went through various experiments with inserting light into scenes, but for this movie, I asked Rin Yamamoto-san, the director of photography, to research into different techniques to make our subjects look their best. Additionally, we also had meetings discussing how to make the movie feel like it was one singular work rather than a series of stories. – The TV series also had some gorgeous scenes created by the use of lighting. With a TV series, there were a lot of times we could only greatly alter the lighting usage during each scene, but for this movie we were able to alter it to better fit the camera orientation for each cut. It’s quite luxurious to be able to do that. Even more for all the minute color alterations done by the color designer, Akiyo Takeda-san. 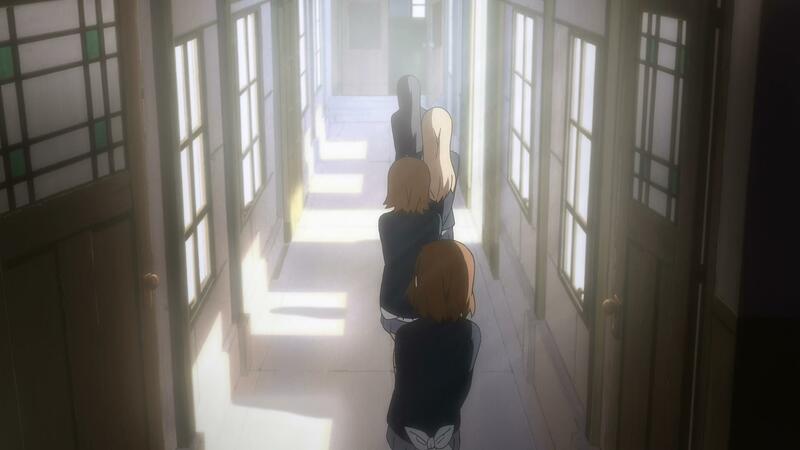 The scene where Tsumugi and Yui meet while walking to school in the A-part was one that was obsessed over. Wintery blue photography combined with the warm light of the sun as it starts to rise makes it feel real. – Then comparing the TV series to the movie esthetically, they look very different, don’t they? – The movie pamphlet mentions altering the shade of colors. I think lowering the shade of colors makes it look more refined. It’s a movie, so I thought doing those kinds of things would make it feel like we were giving it our all to make it look special. Usually, all I care is that the colors appear uniform on the screen, but this was a bit stronger than that. – The storyboards were done by just you and Tatsuya Ishihara-san, right? – Speaking of the C-part, that scene with Yui and Azusa going around entering and leaving the hotel rooms was immensely entertaining when I saw it. I asked him to make the storyboards dynamic so that he could create something that would be an enjoyable highlight and which felt movie-esque. With the girls having connecting rooms, I absolutely wanted to do a gag like the room gag. I thought about how to create the scene while maintaining that “realistic camera” feeling, but I couldn’t create a scene that felt gratifying to me, so I was going to cut it. Handing the C-part to Ishihara-san was the right idea after all. – Could you talk a bit about Hiroko Utsumi-san, the director for the B-part? Utsumi-san works at Animation Do, which is located in Osaka, but she came to Kyoto for the duration of the production. I was really happy she did that so we could talk about the fine details of the film in meetings. She herself has a very entertaining direction style, and since she had always continued to work on the TV series, I felt a sense of relief leaving it to her. She’s also such an enjoyable person to be around; it was wonderful to work with her. – Did you have any important discussions with art director Tamura-san? – With the door’s peephole and doorknob situated so high, it really feels like they were made for foreigners. It felt very realistic. When I went into the washroom at Heathrow Airport, the sinks were so high I thought I was about to be baptized. (laughs) Those doors are foreign, so you’d have to stick your head high to see out. Though Ritsu could peek out through that hole, Yukiko Horiguchi, who went to London with us during the scenario hunting, said she couldn’t see out of it at all. (laughs) Also, since foreigners have big hands, of course the knobs would be thicker than the ones in Japan. – The beds are tall too, aren’t they? They’re tall, very tall. Whenever I went to London, it felt like I had to jump onto my back to be able to go to sleep. 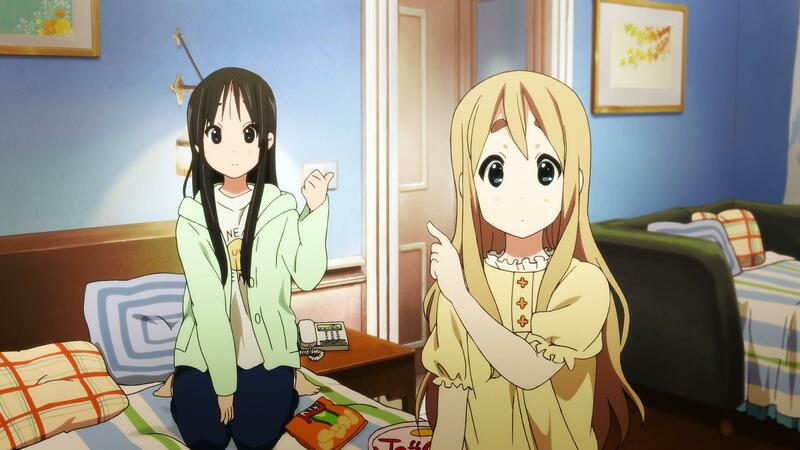 Ritsu and Azusa have such small bodies, it feels like they’d have to climb onto them. Creating that feeling was quite important. – How were Kazumi Ikeda-san and Miku Kadowaki-san chosen to be animation directors? – With the movie completed, what do you think of K-On! now that the series has reached a stopping point? I wanted to create something where it felt like the girls were real beings. Like the sound of Yui’s foot hitting the floor when she’s wearing her tights, or the sound of the girls’ breaths. It’s a work that obsesses over having those realistic sensations. – Their hands and expressions among other things are finely depicted. It’s those kinds of details that create characters’ natures. It feels like they were spontaneously there in the K-On! characters from the moment you meet them. – It feels like there’s a lot of profile shots in scenes with delicate emotions or atmospheric scenes. It’s that respect for the character’s emotions in that shot. “There’s no way they’d want to be shown head on at this time!” Also I felt like unintentionally people would get caught in their dazzling eyes if they were to look at them straight on and share their emotions. I also may feel what they’re thinking when meeting their gaze. Often you’ll see profile cuts at times of delicate emotion depictions. This cut is packed with the director’s desire to get close to the characters’ thoughts and feelings. – From that desire, it feels like a home movie. Ever since the first season started, I thought it’d be wonderful to create something like an album for the girls. Something that they could look back on after they’ve grown up and say “that was fun.”As I thought that, I created something that made you want to continue getting closer and closer to the girls. The TV series also made you want to get closer to the girls and kept people glued to what was happening. Though I didn’t explicitly write directions in the film to bring out that aspect, the desire to want to continually get closer to them comes out strongly. – What are your thoughts on the visuals you created in the movie? Speaking as a third party observer, I love the visuals and want to make something like them. I also feel the sensations from the original manga as well. A third party not only has to feel the excitement rising in them, there also has to be those moments of good cool down too to balance the temperature. If I wasn’t able to control that temperature throughout the entire film, I question if it would lose that feeling the original work had and if K-On! would be shown here. Director/Animator working at Kyoto Animation. Additionally she has directed Tamako Market and worked as episode director/storyboarder on CLANNAD After Story, Kyoukai no Kanata, and Free! This entry was posted in K-On!, Kyoto Animation, Translations and tagged director, k-on, movie, naoko, Translation, yamada. Bookmark the permalink.